Time to register. The fee for the all day workshop is $75.00 for current members and $95.00 for non-members (this includes lapsed members). The fee includes lunch. The fee for non-members includes a one year membership. There is a $10.00 discount for early registration (prior to April 1). There are good session choices to select from. Please look through them and their descriptions (in the schedule below) before you register, as you will be asked to select the ones you would like to attend. If you have any difficulties registering or have any questions about registration, please contact NJMEA. To download a printable copy of the session descriptions, click on the icon to the left. To view a description of each session, click on the title or just roll your mouse over the title. LBI Field Trip Panel - What we offer. What would you like to see? Lunch (provided by The Market Place and Kitchen of Ship Bottom, NJ, awards, and prizes. 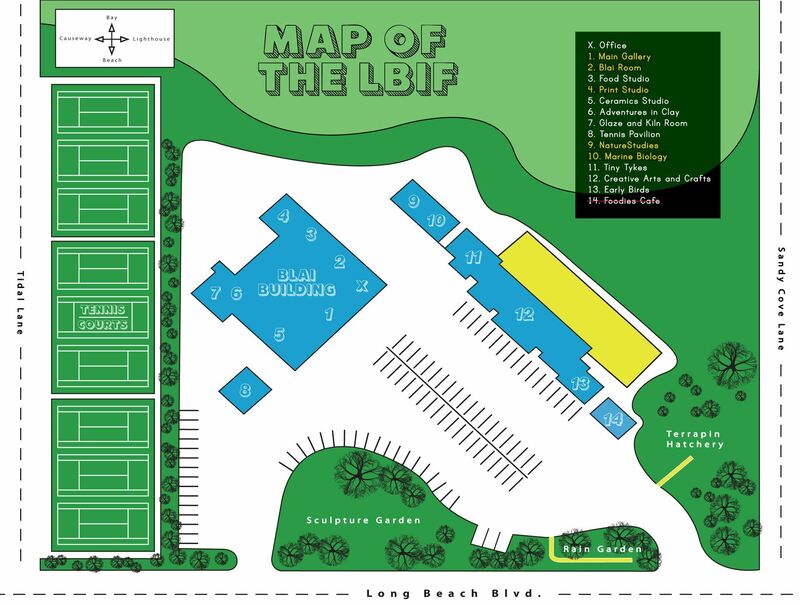 Map of LBIF (parking and rooms) To get a printable pdf version of this map, click here. Please note that this is a double session! Fishbanks is a fun web based interactive, multi-player simulation in which participants play the role of fishing company managers seeking to maximize their net worth. Teams compete and deal with variations in fish stocks and their catch and how that catch impacts the fish population. This simulation takes the groups game play and uses it to drive home the concepts of sustainability and maximum sustainable yield in an interactive and impactful way. Participants will play the simulation first as an introduction, followed by instruction on how to set up and administer the simulation to the students. Extensions will also be presented on policy writing, sustainability and graph interpolation using the framework of the simulation. Fishbanks is a FREE simulation hosted by MIT/Sloan School of Management, that can be used once participants apply for a free account. This session will dive into the topic of water quality. We will discuss exactly what water quality is, what it means to have good quality water, how to test the different parameters of water quality, and discuss what water quality testing can teach us about our surrounding ecosystems. Attendees will have the opportunity to get their hands on some of the latest technology used to assess water quality, while testing their very own water quality samples using Vernier LabQuest2 handhelds and digital temperature, pH, dissolved oxygen, turbidity, and salinity sensors. This fast paced session provides a hands on example of the class that RCTB provides to public and private schools. This demonstration and the actual in school class, splits the group into three segments. Each segment deals with a specific topic: The benefits of biodiversity - with examples taken from our waters. How to grow happy clams, dealing with nutrition and water quality. The services that shellfish provide, including filtering, habitat, and aquaculture, with an emphasis on living shorelines. Over the past fifteen years Conserve Wildlife Foundation of NJ has lead the New Jersey Osprey Monitoring Project. The mission is to continue the groundbreaking recovery efforts conducted over 40 years ago to help the species to rebound from the effects of DDT and habitat loss along the New Jersey coast. Today we survey around 80% of the known population each summer to help ensure that the population remains stable. Despite all of our efforts, there are emerging threats to the health of the osprey population. As we all know, plastics in our rivers, estuaries and oceans is becoming an epidemic around the world. This growing problem threatens wildlife and the overall health of our environment. We estimate that almost every osprey nest in New Jersey contains some form of plastic, which they use to 'decorate' their nests. In 2019 we will begin to document the presence of plastics in nests. The data will be used to help raise awareness for the need to reduce our dependence on single use plastics. In this workshop will will provide information about ospreys and tools that educators can use to help incorporate environmental stewardship in their classrooms. Promoting Oyster Restoration Through Schools (PORTS) is a unique community-based restoration and education program that provides experiential learning in the K-12 environment. The formal education component utilizes the oyster as a vehicle to acquaint K-12 students with the Estuary and scientiﬁc concepts. The workshop will provide an overview of the ecological and sociological importance of oysters and demonstrate how Project PORTS links local science with school communities via oyster reef enhancement. Attendees will explore class activities that utilize real data in learning tasks and participate in the ever popular, That’s Gross Anatomy Lab. This session is based off of a lesson from the MARE curriculum in which students will become familiar with whale anatomy, feeding behavior, and compare themselves to whale size through interactive outdoor games and activities. This session also includes art-infused history lesson on whaling and scrimshaw (art on bone or ivory). Participants will create an artificial piece of scrimshaw art. Beaches and marshes provide a variety of resources, such as habitat, fisheries, recreation and flood protection. However, climate change is threatening these important aspects. This workshop will demonstrate how rising sea levels and increased waves from storms can be mitigated using natural and nature based features by creating living shoreline projects. Participants will learn about the terminology, online resources and case studies. Participants will get to design and build their own living shoreline with natural and man-made structures with a goal of protecting a coastal habitat and infrastructure through a hands-on activity with a wave tank. This hands-on session will involve a discussion of the recent geologic history of the coast including the last glaciation and its impact on sea level, the coastal processed affecting the position and shape of the shoreline, the collection and use of the beach profile data, impacts of storms and fair-weather conditions on beach erosion, deposition, and climate change. Weather permitting, participants will take a 3-5 minute walk from the LBI Foundation to the beach for the discussion and the habitat profiling activity. Teachers will learn about and participate in the beach profiling method, how to measure elevation changes, and record data which can be analyzed in the classroom. Activities and concepts in this session are most appropriate for students grades 6 and up. New Jersey's commercial and recreational fishing industries annually account for more than $3 billion in economic impacts to the state economy and provide nearly 50,000 jobs. Given the high socio-economic value of these industries, it is critical that our marine fishery resources are wisely managed to support the long-term sustainability of these resources and the associated industries. This session will provide an overview of New Jersey's commercial and recreational fishing industries, and cover the fisheries science and management processes involved with managing New Jersey's fisheries. Information covered during the session, as well as educational resources that will be provided, will help educators to deliver educational programming on topics related to fisheries science and management in New Jersey and the Middle-Atlantic. I was the primary photographer for the Marine Mammal Stranding Center from when it was founded in 1978, until 1998. I have thousands of slides / pictures that I took of strandings and rehabilitations of whales, dolphins, porpoises, seals, and sea turtles that I took during those 20 years. During my last 27 years of teaching HS Sciences, I primarily taught Oceanography. I used these slides in the course of teaching marine mammals. Topics covered during the session would include what makes a marine mammal different from land based mammals both legally and physically. Many of the slides were taken during necropsy of different types, showing internal anatomy. I also have numerous posters for display and photographing. Mordecai Island is a nationally recognized 45-acre salt marsh island that is managed by the Mordecai Land Trust and is located off Beach Haven’s coast on Long Beach Island. Over the years the island has experienced substantial erosion to it’s western shores, jeopardizing the natural habitats and diverse species that the island supports and impacting the buffering and flood protection that it affords the neighboring Beach Haven community. In partnership with local and governmental agencies, several unique restoration and living break-water projects have recently been implemented, including the installation of Geotubes, oyster castle arrays, and beneficial use dredging. Although these projects were designed to mitigate erosion, surprisingly, they have also created a microcosm for beach and salt marsh environments with over-lapping conservational benefits. Experience the Barnegat Bay first hand through this interactive interpretive trail tour! Naturalist and Environmental Biologist Michele Budd will take guests outside to explore the flora and fauna of the tidal salt marshes and maritime forests that surround the LBI Foundation. The tour also includes an up-close view of an osprey nest through an osprey blind overlooking Barnegat Bay. This tour is 0.4 miles round trip with uneven ground in some areas. There is no animal more maligned and at the same time worthier of attention than the horseshoe crab; and if there were only one creature to bring into a marine biology class for study, Limulus should be on the top of your list. In this session, participants will describe physical adaptations used by horseshoe crabs for locomotion, feeding, protection and vision; and will use familiar items as analogies to 'construct' and study a horseshoe crab. A 'Limulist' resource chest will be demonstrated, along images of larvae. Participants also will examine the great variety of epibionts that hitchhike on a horseshoe crab and how they save people’s lives every day with their “blue” blood - Limulus Amoebocyte Lysate (LAL). Long Beach Island has a lot to offer for educational field trips. BUT...What would you like to see? This interactive session will provide an overview of things to see on LBI and will use those to stimulate the conversation about things you believe would be beneficial to you students. Back to top of schedule.